Apologies for the blog absence as of late! That blog should be all put together and dropping later this week or next, however I thought I'd use a part of that blog as a teaser to share with you all. In Section from the fat loss blog we're discussing the different factors to consider when it comes to picking your dietary approach. I don't think enough people take into account what personally suits them before they hop on a diet. 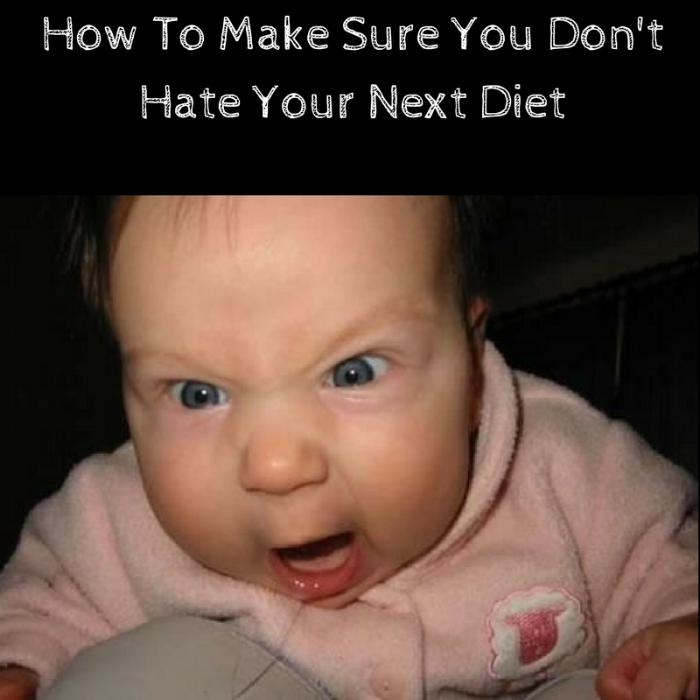 We've all heard the person who described how much they hate the current diet they were on, and we knew they wouldn't stick with it. The goal of this blog is to make sure you're not that person! 1. )Activity level & what kind of activity are you doing ? Your overall fat loss will be controlled by your calorie intake, however if you’re able to better fuel your activity in the gym and throughout the day you will recover better and allow for more high quality work in the gym. Being less sore and recovering better can translate to more movement throughout the day, more trips to the gym and an overall greater calorie burn. While the calories expended may be small every advantage in fat loss should be used. More intense and longer forms of exercise like crossfit or mixed martial arts are going to be better fueled with a higher carbohydrate intake which can will also help with recovery. Those with a more active lifestyle or job like someone who works in manual labor or as a waiter will also be able to to better tolerate carbs due to their overall activity, and calorie burn throughout the day. If you’re more sedentary, and hit the gym for an hour a few times per week you’ll do fine with a more even split of carbohydrates and fats, but likely won’t need a higher end intake of carbohydrates. Those who are very overweight and live a more sedentary life may benefit from keeping carbohydrates lower and increasing fats to help with some initial weight loss and help to remove some of the easier to overeat calorie dense foods. 2. )What foods do you enjoy eating ? Your dietary preference, and the foods you enjoy eating is something that needs to be considered when it comes to choosing your diet as well. Adherence and consistency are the two largest factors when it comes to seeing fat loss results. If you feel poorly and don’t like the foods you’re eating on a specific diet than your chances of sticking with it are going to be very low. However if you eat in way that you enjoy, and feel less deprived then it’s much easier to stay consistent. Trying to fit a round peg in a square hole is never going to be a good fit, and there’s a multitude of dietary approaches to choose from. Choose the approach you can see yourself sticking to for a longer period of time. 3. )Are there foods you have strong aversions to ? This could also be categorized in the foods you enjoy section but this on the opposite end of that spectrum with foods that you don’t do well with. Maybe they upset your digestion, make you feel bloated or you have a full blown food allergy. Your dietary approach should reflect these needs. If you’re someone who doesn’t tolerate gluten or grains very well or have a specific autoimmune condition giving the paleo diet a try or even the autoimmune paleo protocol could be helpful. If you have lots of digestive issues you may need to use an approach such excludes certain types of carbohydrates and nightshades like on the FODMAPS diet. 4. )Do you like more carbs or fats more ? Generally people like foods that are going to be denser in carbohydrates or more fatty, maybe an even split of the two. If you really enjoy fattier foods then going ketogenic may be a good approach for you to follow, but if you prefer more carbs then this wouldn’t be the right fit for you. When it comes to carbs and fats I view them as a teeter totter meaning if one goes up, then the other has to come down to make room in the total calories for fat loss to happen. As an example if you increase carbs that means fats need to be reduced, in the same way that if fats are increased carbs need to be decreased to make sure you’re achieving a calorie deficit. 5. 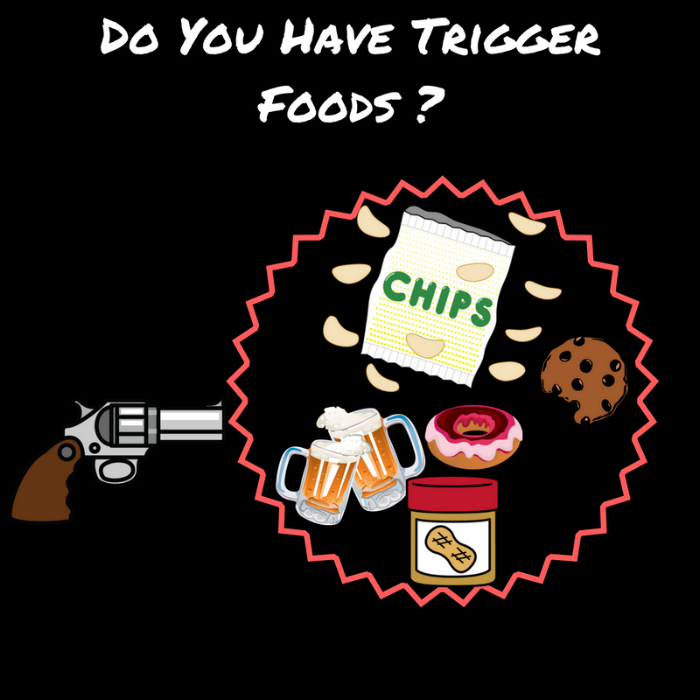 )Do You Have AnyTrigger foods ? If there are certain foods that are very easy for you to overeat, or you choose not to use control when you start eating them it might be better to choose a dietary approach that excludes these foods for you, and give clear guidelines to not consume them. You might need to draw a line in the sand and keep these foods out of the house for a period of time to allow yourself to build some uninterrupted momentum towards your goal. 6. )Are you heavier or leaner ? Overall calorie intake and balance will be the main driver of your ability to lose fat at the end of the day. However your level of body fat can impact how well you metabolize carbohydrates, and your bodies ability to use them efficiently. If you have a significant amount of fat to lose, and are very overweight or obese using a lower carb approach in the beginning can be better as your ability to use carbs efficiently will be reduced. Some people find a lower carb approach to be more satiating, help with hunger levels, balance out energy and curb cravings which are all big wins on a fat loss plan. The initial water reduction from lowering carbs diets can also be highly motivating for when you have a lot of weight to lose. Seeing the number on the scale drop quickly helps you to feel encouraged by the process ahead and seeing progress like that can help with adherence. Those who are leaner, and have a higher level of activity are likely to do better with more carbs prioritized in their diet. 7. )Have you had success in the past, and what approach did you use ? When you look back through your past with changing your nutrition habits or dieting it’s important to think about what aspects of past diets worked well, and what didn’t work well. From there the goal is to replicate what worked well for you, while avoiding the things that didn’t meet your needs or suit you. I do this with my clients and write the different qualities of each down so we can use these points in developing their nutrition plan. What diets have you tried in the past ? What did you like about that approach ? What didn’t you like about that approach ? If you're not sure where to go next because trying what you've used in the past isn't working anymore click the button below and let's get you on the right path towards your fat loss goals! 8. )Rigid or Flexible Strategy ? This is a personality trait that’s helpful to understand about yourself when it comes to developing a nutrition strategy that fits you as an individual. Rigid: People who are more on the rigid side of things do much better with built in rules like eating certain foods, and avoiding others entirely. The structure of a more rigid approach allows this individual to be more successful because it serves their black and white mentality with foods. There are foods they eat, and other they avoid which makes it simple, cut and dry. As an example someone who restricts avoids cookies, because they end up eating the entire sleeve of cookies once the seal is broken. 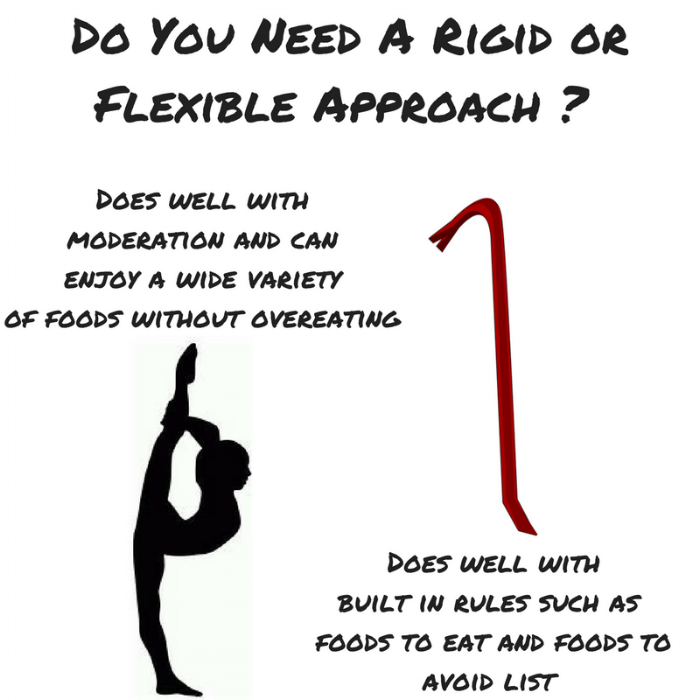 Flexible: This is the kind of person who can moderate their intake of foods very well, and is able to enjoy a wide range of foods without feeling the compulsion to overeat on certain foods. The people who do well with a more flexible approach are the folks who can have a cookie or two because it fits their plan, and then put the package back in cupboard. This is strictly anecdotal based on my experience but I’ve found that people who do well on a flexible approach have a more analytical type A personality type, and enjoy the numbers game of calories and macros. Metabolic health refers to someone who has a past history of extreme and or crash dieting and has tried every diet under the sun in the pursuit of fat loss. For those of you who have crash dieted for years, and lived in the diet and binge cycle without any time spent just trying to maintain body weight levels you may not be in a metabolically or psychologically healthy state to go on another diet. This is the last thing you want to hear if you have a fat loss goal, but if you’ve put your body through the ringer with diet after diet and losing and gaining weight year after year something isn’t working and a new approach is needed. The ability to maintain your weight is just as important, if not more so than you ability to lose weight. Everyone has lost weight before, however very few people have learned how to maintain their new weight and tend to gain it right back. You may need to give the body some time to be at a stable body weight, and repair your relationship with food before you consider going on another diet. Because I don’t know you dieting history it’s tough to say how long you should aim to maintain for but a period of 6 months seems reasonable. I know this is not what you wanted to read in a blog on fat loss, but if this section has resonated with you, and you’re done banging your head against the wall then it may be time to learn how to maintain before you consider trying to lose fat again. While yes calories are going to be the main determining factor of your fat loss, keep in mind that the quality of foods you consume is going to have a huge impact on your hunger levels and overall health/longevity. Even when people follow the 80/20 principle of flexibility, keep in mind that 80% of someone’s diet is still coming from nutrient dense whole foods. Enjoying indulgences from time to time is nice, but when it comes to managing your hunger and staying fuller for longer while keeping calories in check whole foods wins that race.